When I go to bed at night, the last thing I check is my phone and vice versa when I wake up in the morning. My mom would always tell me to “put my phone away an hour before bed” because it negatively affected my sleep. Although I never really listened to her, I can feel the affects weighing on the amount of sleep I get now. The reasons behind this is because the light reflected from the screen negatively impacts our internal clocks causing our sleep patterns to scatter. An article posted by BusinessInsider.com explained to me how the lights reflected from the I-phone are blue and white lights. This leads to the prevention of melatonin being released from our brain which is a vital hormone that informs our body that it is time to sleep. When melatonin is not released right at bed time it makes falling asleep a much more difficult task. Experts suggest that turning your phone off an hour before bed time could lead to a much deeper and faster sleep. A study was conducted and the researchers found out that a double expresso coffee does not negatively affect your sleep as bad as your cell phone does. The blue light is so strong that when our brain receives the light it comes off as a sun glare, which results in our sleep time being pushed back as well as our melatonin not being released from our brain. 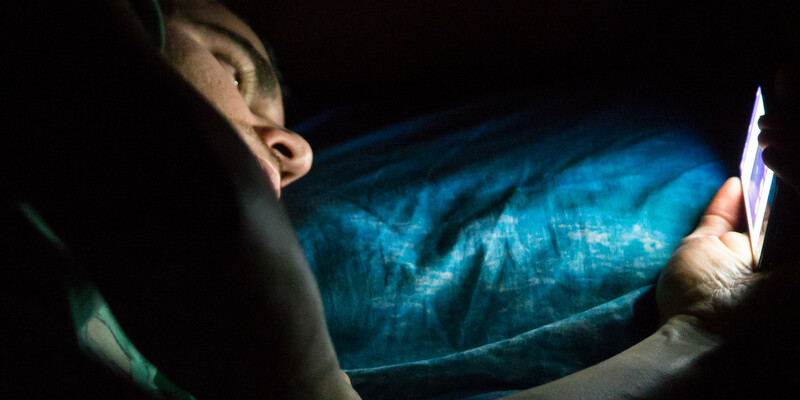 The light reflected from your phone is basically telling your brain not to sleep. All in all, put your phone away about an hour before you go to bed and watch your sleep increase dramatically. This entry was posted in Uncategorized on September 14, 2016 by dhc5097. According to this article by iKeepSafe, there are other health benefits associated with unplugging from not just your phone but all electronics two hours before you want to go to bed. You quality of sleep will improve because the blue light emitted effects your sleep cycle. So when you are on your phone or watching tv before you go to sleep you are more likely to be restless and not get a good nights rest. It can also help you loose weight since lack of sleep is proven to slow down your metabolism. There are so many benefits from unplugging from technology before bed. I thought that you would be interesting in learning more benefits that related to turning off your phone before bed. I used to have really bad sleeping problems and I didn’t know what it was from. My dad then told me that I shouldn’t be watching Netflix or being on my phone before I go to sleep. So, for a couple days I didn’t use any technology before I went to bed and I slept through the night perfectly. This theory is correct! Checking my phone before I go to bed and catching up on all social media is a habit that I have gained over these past couple years, and it’s not a good one. My mom has told me the same thing as yours; to put my phone away an hour before sleep and to even not have it charging on my bed but to have it charged on a table. Have you heard of the stories that peoples pillows caught on fire since they were charging their phones under their pillow? Anyway, I use the new night shift setting on my phone now which makes my phone almost yellow looking now at night since supposedly, like you said the white light stimulates your brain, and I have found that it is easier for me to fall asleep, try it! Check out this article, http://www.livescience.com/54167-apple-night-shift-sleep.html it talks about whether it actually makes you sleep better or not. This is actually a very useful and practical blog post. I am going to try and not look at my phone for 30 minutes from now on before I go to sleep when possible and see if I can find better sleep results than I’ve gotten so far in this dorm. At the very least I will turn my brightness down all the way from now on because that blue and white light is crushing my melatonin flow! I can definitely relate to this because I find it extremely hard to put my phone down at night. Sometimes I won’t even realize it and an hour will go by, during which I could have been sleeping! I always had really good vision, but over the past two years or so it has gotten worse. My doctor asked if I am on my phone a lot and I told him I am. He told me that that is probably the reason that my eyesight has declined so quickly. I also reach for it as soon as I wake up to check my text messages and social media, so there is no doubt it is a distraction for me all the time. This article is very interesting. I have read many articles on cellphones disturbing sleep habits. I understand that blue light prohibits melatonin production, which makes it harder to fall asleep at night. However, when the phone is off and your eyes are shut, does the blue light still have an impact on sleep habits? I found an article written by Harvard researchers, that if you keep your cellphone 14 inches away from you the blue light is less likely to affect your sleeping habits. This could be an alternative to leaving your phone behind the hour before you go to sleep. You should check this out! This is an interesting article to me because I also lay in bed checking my instagram, twitter, facebook, and snapchat before I go to bed. I often wonder why it is so hard for me to go sleep some nights and can usually attribute that to my phone since I am constantly wondering if I have a text message or if something new popped up on social media that I don’t want to miss. http://www.techinsider.io/how-smartphone-light-affects-your-brain-and-body-2015-9 here Here is an interesting article I found that further explores what using your phone before bed does to your body. Living in this generation, we are basically glued to our phones. I myself start and end everyday by checking my phone and I always unsure what the effects of doing so were. After reading this post I am more educated of the effects of doing this.